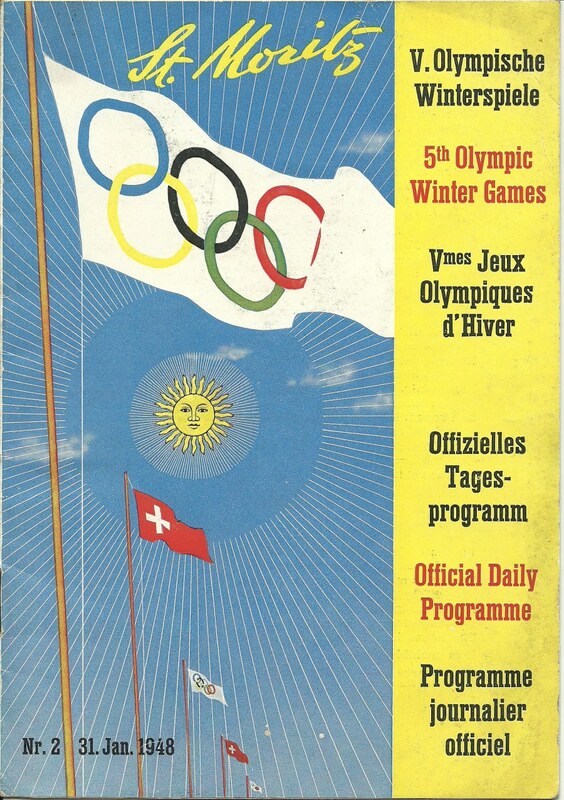 The 1948 Winter Olympics, officially known as the V Olympic Winter Games, was a winter multi–sport event celebrated in 1948 in St. Moritz, Switzerland. 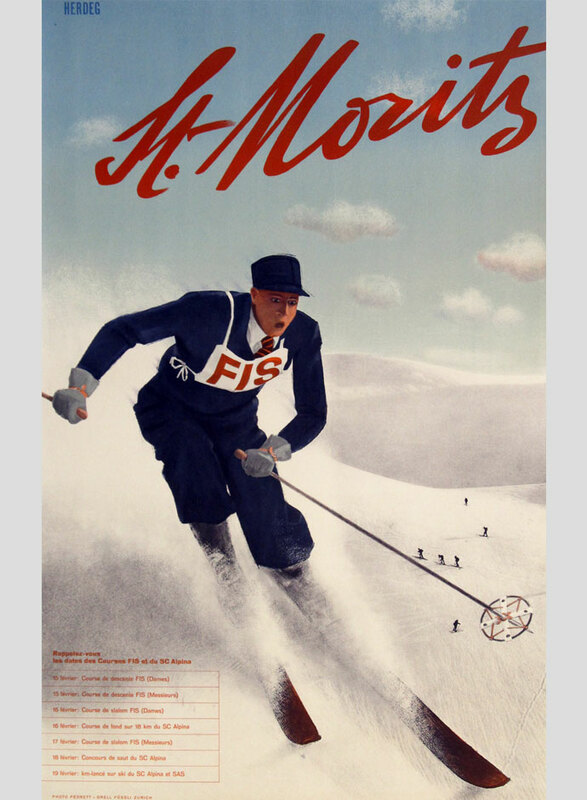 The Games were the first to be celebrated after World War II; it had been twelve years since the last Winter Games in 1936. The famed village of St. Moritz, winter playground for the rich and famous, is situated in the Swiss Alps on the slopes of the highest (6,000 feet) major valley (Upper Engadine) in Europe. 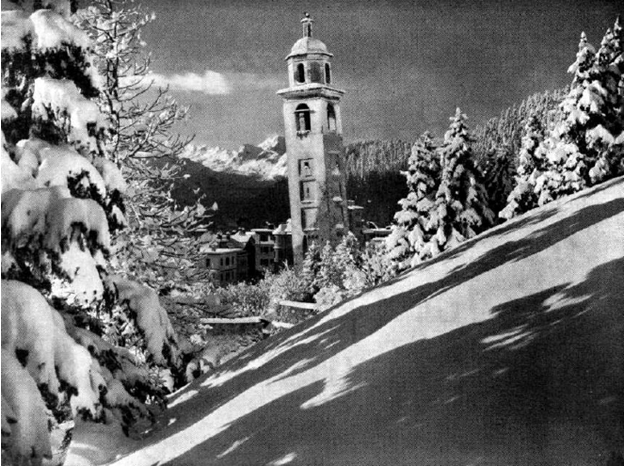 We arrived in St Moritz on the afternoon of February 28, 1948 coming from Zurich. The USA AHA hockey team happened to be on the same train with us. The arrival of all trains is heralded by the station bells. Hotel porters with the names of their establishments emblazoned across their caps stand smartly at attention waiting for their clientele. When we arrived we were pleased to see that the snow lay five feet deep. It was dry and powdery on top, packed solid beneath, ideal for skiing. Above the peaceful town towered the two giant mountains, the Languard and Julier, with dark green firs leading up their slopes from the village. The streets in the village were white–carpeted with snow. The clear, crisp notes of church bells chime every quarter of an hour and on the hour. The tinkling bells of the horse drawn sleigh "taxis" add a magical atmosphere to the village. A chockablock jumble of low, square houses along with and great, ugly (rectangular shaped with flat roofs), expensive hotels comprised the village. Villagers, doing their day's marketing, dodged visiting skiers in the streets. Crowded little St. Moritz (pop. 2,500) had set up 4,000 extra beds for the games – which would not be nearly enough. At the swank Palace Hotel, the untitled and titled rich and the poor had their choice of more varieties of scotch than could be had in all of Paris. The crowd that watched the ceremony was manifestly rich. In Europe at that time, there were few who could afford to make the trip from the torn, hungry countries to this lavish resort village consisting almost entirely of hotels and shops. Celebrity–hunters had their pick of ex–King Peter and Alexandra of Yugoslavia, rich Spanish Duke of Kalba and his newly married daughter, Duchess of Montoro and her ducal husband Prince Bertil of Sweden; any number of princes and dukes and British notables including Lord Burghley, 400 meter Olympic hurdle champion in 1928 and now in charge of the summer games in London, Britain's famed Jockey Gordon Richards, or American film and theatre star Paulette Goddard and her husband Burgess Meredith; Johnny Weissmuller, a former Olympic swimmer andnow best known for his role in the Tarzan movies; Henry Ford and his new wife and so on. There were to be 28 nations that marched in the opening ceremonies on January 30, 1948. Nearly 670 athletes (592 men, 77 women) competed in 22 events in four sports. 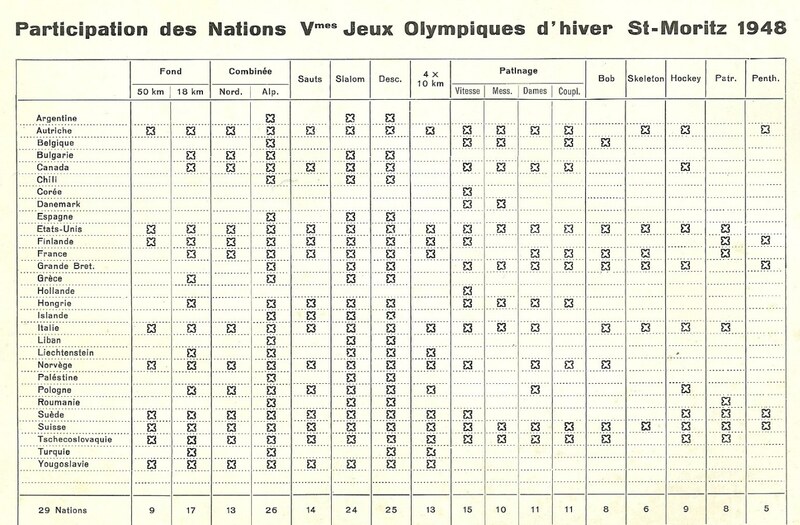 The Games also featured two demonstration sports: military patrol, which later became the biathlon, and winter pentathlon, which was discontinued after these Games. As it turned out, more people would see the ice hockey and figure skating events than anything else – possibly because spectators could watch them from their hotel balconies! 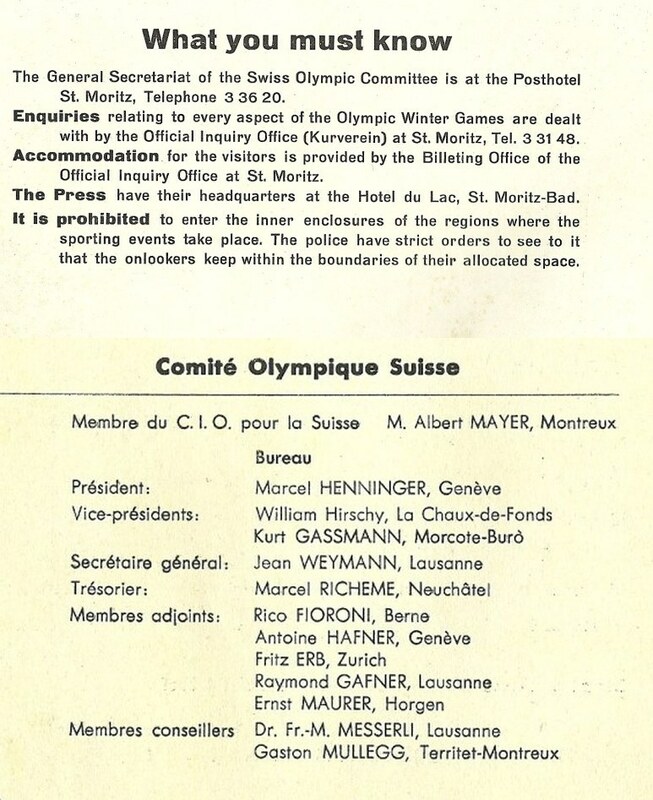 Most of the athletic venues were already in existence from the first time St. Moritz hosted the Winter Games in 1928. All of the venues were outdoors, which meant the Games were heavily dependent on favorable weather conditions. Chile, Denmark, Iceland, Korea, and Lebanon all made their Winter Olympic debut at these Games. 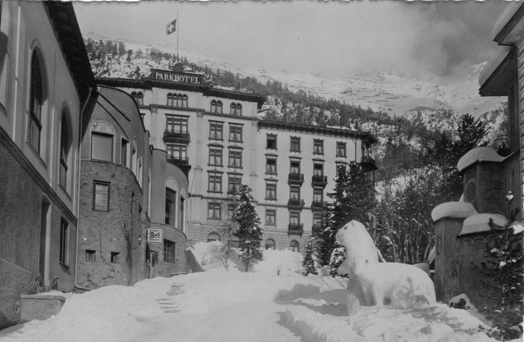 My fiance Bea was staying at a very nice hotel, the Park Hotel, just at the edge of St. Moritz. 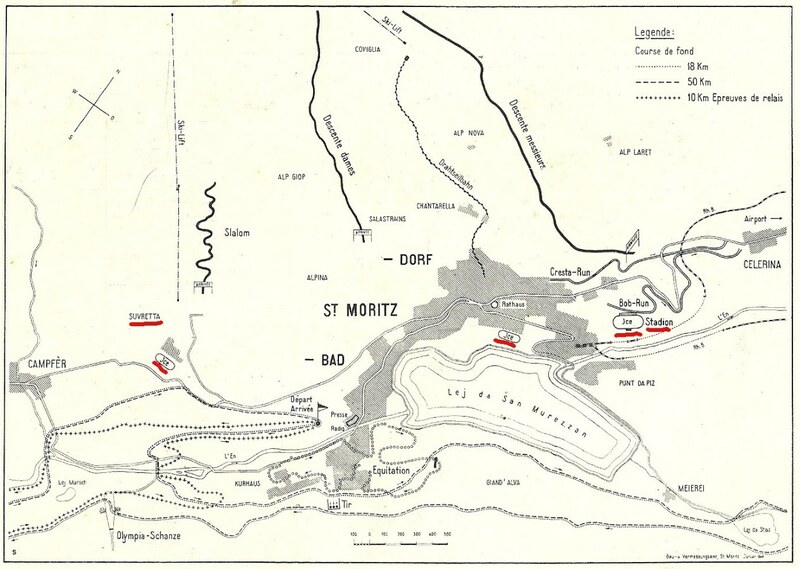 When the team had arrived at St. Mortitz, we were told that no arrangements had been made for our hotel lodging. Apparantly the Canadian Olympic Association had dropped the ball. After some heated words, the Swiss Olympic Committee found us lodging at the Stahlbad Hotel. 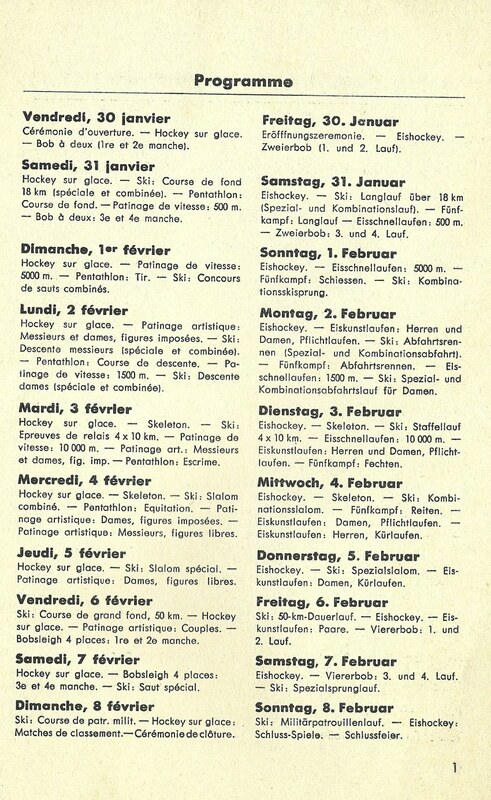 As with all hotels in Switzerland where we'd stayed, the Stahlbad was a refreshing counter–point to the sparse accommodations and food rationing that we’d experienced in our pre–exhibition tour in England and France. Being just on the outskirts of town, there wasn’t a lot to do, and gave us time to rest up between games. Some of the boys amused themselves with nightly dancing at the hotel but most stayed in and played cards. 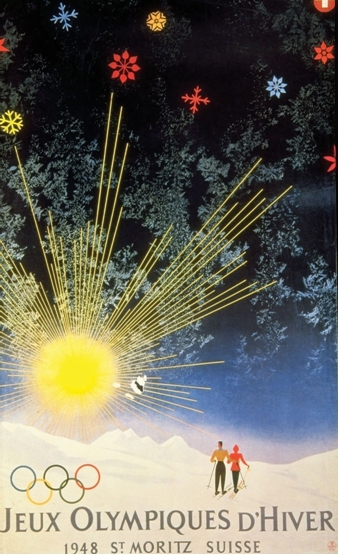 I, of course, met with my fiancée Bea, who had arrived in St. Moritz just ahead of me. However I stayed at the Stahlbad with the team during the games, rooming with Frank Dunster and also a "friend" of George Mara, Bron Robinson who'd somehow talked himself in to our entourage. Also at the Stahlbad were the Czechs, Norwegians, Poles, English, Swedes, Yugoslaves and the Romanians. 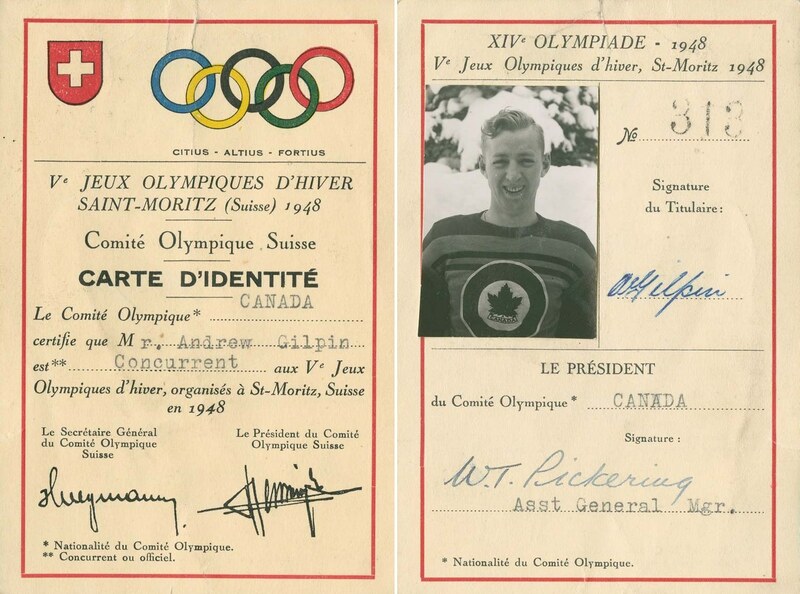 As participants in the 1948 Olympics, each member of the RCAF Flyers hockey team was given a "CARTE D'IDENTITÉ" card.